United States public speaking audiences are becoming more and more culturally diverse. It is your responsibility as a public speaker to be aware of and acknowledge significant portions of the audience that come from diverse backgrounds. If you are speaking in a different country, again, it is up to you to find out about local customs and types of humor that are appreciated in that locale. The response to humor is quite different for different cultures. Paying close attention to this fact will give you a greater chance of connecting with international audiences in and out of the U.S. You will also be more aware of etiquette and customs that will make you a welcome speaker anywhere you go. If you are not familiar with your intended audience, in your pre- program research you might ask, "How diverse is your group? Or do you have members from other countries?" The answers to these questions will help you plan your strategy for connecting with a particular audience. I was doing my planning for a speech in Baltimore, Maryland and found out that twenty-five percent of the audience was Asian Indian. I knew nothing about the Indian culture and didn't have long to plan. What I did know was the Dunkin' Donut store near my home was owned and run by Indians. That was a good excuse to stop in, down a few eclairs, and do some research. I told the proprietor what I was trying to accomplish and he was glad to help. Out of all the information he gave me about humor in India, I only used one line. That was all it took to connect. The line was, I want to tell all my new Indian friends that I'm sorry Johnny Lever couldn't make it. Johnny Lever was one of the top comedians in India. They lit up and I went on with the program. If your local donut shop isn't run by the appropriate nationality for your next speaking engagement, don't worry. There are other sure-fire methods to get the information you need. If you are speaking outside the US, get the opinion of local people before you attempt to use humor. If you are speaking in the U.S., seek out members of the nationality to whom you are speaking. If you don't happen to know any, you can always call their embassy. I've called our State Department, The World Bank, Voice of America and many other public agencies for information. Just tell the receptionist you want to speak to someone from the country of interest. Don't forget to tell them you want to converse in English. When speaking to foreign audiences you must check your humor carefully so you don't accidentally offend someone. In some countries you may hear people openly joking on television or in public about subjects that would be taboo in the U.S. That doesn't mean you can attempt to joke about the same subjects in your presentation. 1. In Columbia if you wanted to show the height of an animal you would hold your arm out palm down and raise it to the appropriate height. If you are trying to show the height of a person, you do the same thing, but your palm is on edge. So, if you meant to show the height of a person, but you did it palm down as we normally would in the U.S., you would have either insulted the person by treating he or she like an animal or you would have confused your audience because they would now think that you were actually talking about an animal that had the name of a person. See how crazy this can get. 3. In Latin American and the Middle East people stand much closer while conversing. If you were interacting with a person from one of these cultures during a public speaking engagement and you backed away to keep a normal U.S. personal space, you would be sending a very unfriendly message. Asians, however typically stand farther apart. Your understanding of this will keep you from chasing them all over the stage. Keep this in mind too if you go into the audience to interact with them. Since they are seated, you control the interpersonal space. 1. You might think you are putting your audience to sleep in Japan, but don't worry. In Japan it is common to show concentration and attentiveness in public by closing the eyes and nodding the head up and down slightly. -- Then again, maybe you really are boring. 3. If you were finishing a speaking engagement in Argentina and you waved goodbye, U.S. style, the members of the audience might all turn around and come back to sit down. To them the wave means, "Hey! Come back." In other parts of Latin American and in Europe the same wave means "no." The book I previously mentioned has hundreds of tips that will help keep the audience on your side when you present outside the U. S. Another good and inexpensive source of international background information is the Culturgram published by the David M. Kennedy Center for International Studies, which is part of Brigham Young University, located in Provo, Utah. Each Culturgram is a four page newsletter that gives you an easy to understand overview of the country of your choice. It includes customs and common courtesies, along with information about the people and their lifestyle. References point you toward additional study resources. Currently Culturgrams are available for 118 countries. Regardless of one's nationality and culture, cartoons and comic strips are the most universally accepted format for humor. A good resource is Witty World International Cartoon Magazine by Creators Syndicate 310-337-7003. If you are speaking to a small group you can hold up the magazine or pass it around. If you want to use the cartoon or comic strip in a visual, you may need permission from the copyright holder. Always read the caption for a foreign audience and give them time to mentally translate what you say. It may take what seems to be forever (4-6 seconds) for the idea to sink in. Other forms of visual humor that transcend most cultural barriers are juggling and magic. I don't do either, but good resources are available. Speaking With Magic is a book by Michael Jeffreys that not only teaches you simple tricks, but gives you the points you can relate to the trick. I got my copy from Royal Publishing, Box 1120, Glendora, CA 91740 Phone (626) 335-8069. For juggling and other magic books call or write for Morris Costume's Catalog, 3108 Monroe Road, Charlotte, NC 28205 Phone (704) 332-3304. There is a charge for the catalog, but it's worth it. Terminology is different in most areas of the world even if the country is English based. Highly tested humor that would work anywhere in the U.S. may fall flat in another country simply because the audience doesn't understand one of the words. 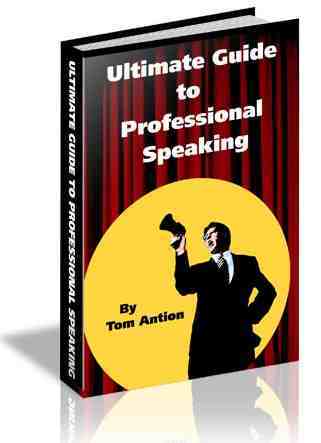 For example, in Australia, public speaking break out sessions are called syndicates. If you were making a joke that used the word syndicate, you may totally confuse the audience and they won't laugh. People from most other countries will not relate easily if you mention miles per gallon or miles per hour. You should avoid speaking about seasons, sports figures or celebrities that don't have world-wide name recognition. Rethink all humor you normally use and try to find problematic words. This is difficult to do by yourself. Try to find a person familiar with the local culture to help you. When using translators, humor is tougher because timing and word play don't translate well. You might have to slow down considerably because of interpretation. Some speakers use half sentences to keep up the pace. This is very difficult and requires practice. * Remember -the U.S. is the foreign country when you speak outside its borders. Lots of things can be different and you should be prepared. Many countries have different standard paper sizes and use two hole punches instead of three. Any video you plan to use must be converted to PAL. You may need a converter to operate equipment you bring with you. * South of the border people don't like us to refer to ourselves as Americans. We must remember that we are not the only ones. There are North Americans, Central Americans and South Americans. * In Japan you should never use self-effacing humor during your public speaking engagement which is well received in American culture. Actually, the Japanese don't like humor in seminars at all. Conversely, Australians love humor.